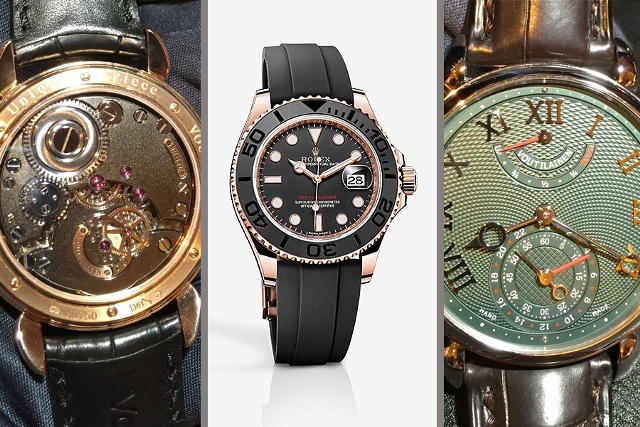 A few weeks after returning from Baselworld, we asked members of iW’s Leading Watch Retailers to tell us what they saw, liked and didn’t like during their recent tour of the show’s watch purveyors. In this second installment of our LWR report, Robert Weintraub (RW) from Manfredi Jewels in Greenwich, Connecticut; Joe Turchiarolo (JT) and Dimitri Galanis (DG), both from Liljenquist & Beckstead Jewelers in the Washington, D.C., metropolitan area; and Alexis Zocco (AZ) and Al Armstrong (AA) from Armstrong Rockwell Watches & Fine Jewelry in Hartford, Connecticut, discuss the watch trends they saw in Basel and share notes and pictures about favorite timepieces they spied during their trip. Which brands or individuals were you particularly excited to see? DG: I was intrigued, as you may expect, with the traditional brands and that’s where my favorite timepieces can be found. Rolex’s new 40mm Yacht-master with Everose gold, matte black dial and ceramic bezel with the Oysterflex strap is on top of my list with its incredible color combination. AA and AZ: We were thrilled to meet Edouard Meylan, son of George Henri Meylan, former CEO of Audemars Piguet. The Meylan family, descendants of C.H. Meylan, a watch manufacturer, was known for exquisite quality and complications as well as a rich history in the Vallée de Joux (Meylan is one of the five basic names in that region). RW: Omega and Rolex, and Kari Voutilainen. We do always visit the ACHI and smaller independent brands to keep aware emerging young talent. Were there some surprises from any the brands? Any favorites? JT: One of most surprising launches of the fair was the introduction of the new rose gold and Cerachrome bezel Rolex Yacht-master fitted with the innovative Oysterflex bracelet developed and patented by Rolex. Arguably the most talked about luxury watch was the new Pilot’s watch by Patek Philippe. A shocking unexpected release with inspiration taken from one of the watches from their museum. After much press I believe it will be one of the most requested watches this year. RW: Chopard. They pared down their offerings to a more manageable amount, and have a smart plan to help their retailer’s business by focusing on a basic core product line that will help inventory turn. Favorites: Omega Snoopy, Ulysse Nardin Anchor Escapement Tourbillon, Laurent Ferrier Galet Square, Breguet Tradition Minute Repeater. Did you perceive any overall design or technical trends? RW: We are finding that comfort on the wrist is becoming more important to our clients than in previous years. Most brands are offering a large selection of size choices, but surprisingly are still introducing larger watches from 43-48mm, which in previous years, the brands seemed to be moving away from. There is still a continued trend of modern re-interpretations of classic historical designs. DG: Apple is definitely on the mind of the Swiss Watch brands CEO’s. That explains the introduction of the Bulgari Micro chip watch (with its own app), and the forthcoming collaboration between TAG Heuer, Google and Intel. Not to be outdone, Breitling has the B 55 Connected watch made for pilots and connected to an app. 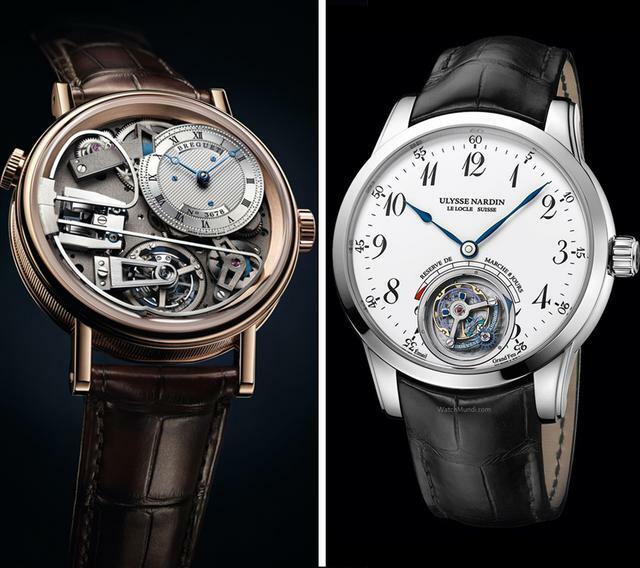 Although the intersection of technology and Swiss watches is nothing new, what is different this time around is that luxury watchmakers are willing to enter the intersection. Time will tell if this experiment will be successful. Any additional comments about the event? JT: The mood was cautious optimism from buyers. Watches at reasonable prices with emphasis on classic, timeless design. In other words, a focus on Swiss quality and heritage. 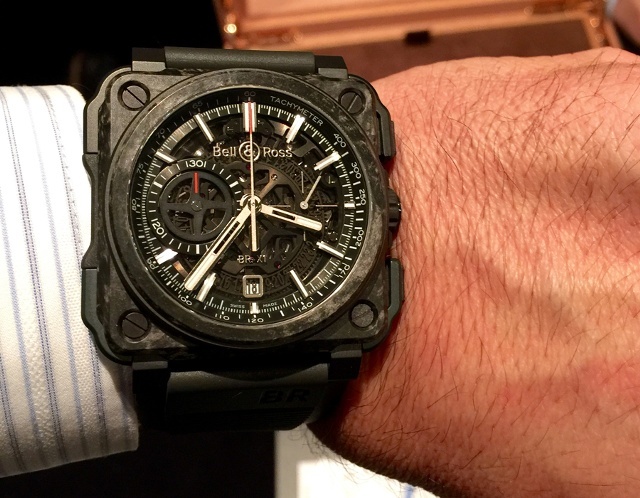 The buzz at this Basel Fair had a completely different side to it, which has never existed before: connected watches or the smartwatch technology fitting into the luxury Swiss blueprint. Our brands like Breitling, Bulgari & TAG Heuer already announced watches with this new technology. RW: This year while excited as always, due to the recent currency fluctuation issues, and unknown price changes, we were more conservative with our purchasing this year.